Cebu is known as the Queen City of the South. This province in the Visayas is one of the most popular tourist destinations in the Philippines. Cebu boasts some of the best white sand beaches in the country. The beaches of Moalboal, the Sugar Beach of Bantayan Island and the Santiago Bay of Camotes Island are just a few of must see beaches in Cebu. Cebu is also home to the majestic Kawasan Falls and also a site for whale shark watching particularly in the town of Oslob. There are also a lot of tourist spots in Cebu such as the Tops, the Mactan Shrine, Fort San Pedro, Guitar factories, Magellan’s Cross and other attractions. One of the must see events in Cebu is the Sinulog Festival. This is one of the grandest festivals in the Philippines and is attended by millions of participants and viewers every year. Highlights for this event are the Street Dancing Completion and the Fluvial Parade. The Sinulog Festival in Cebu is held every January. Cebu can be reached by plane or by boat. Taking a plane is the easiest way to reach Cebu. It just takes about an hour and 15 minutes from Manila to reach Mactan International Airport in Lapu-lapu City. Various airline companies have daily trips to Cebu such as Cebu Pacific Air, Philippine Airlines, Zestair, Tiger Airways and Airphil Express. The Mactan International Airport also serves international flights to and from Hong Kong, Singapore and others. Cebu Pacific Air is one of the most preferred airline companies when flying to Cebu. This airlines is known for its budget seats and promo fares such as their famous Piso Fare promo. Cebu Pacific is a budget airline that offers several flights from Manila to Cebu and vice versa daily. Cebu Pacific uses the NAIA Terminal 3 in Pasay as its hub for domestic flights such as those bound for Cebu. If you want to fly via Cebu Pacific next time you visit the “Queen City of the South”, you can book to any of these daily flights from Manila. 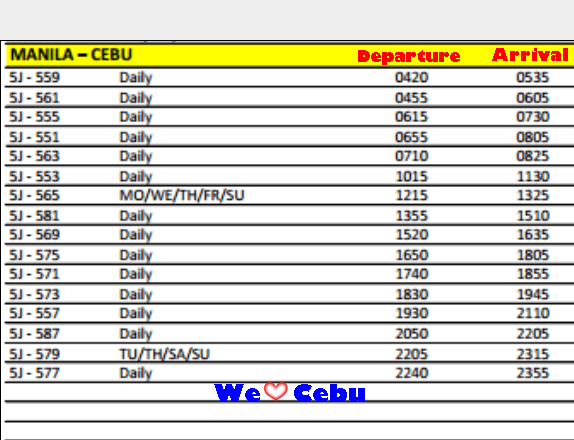 Here is the list of the Cebu Pacific Daily Schedule of Flights from Manila to Cebu and Vice Versa to help you out when planning your vacations here. 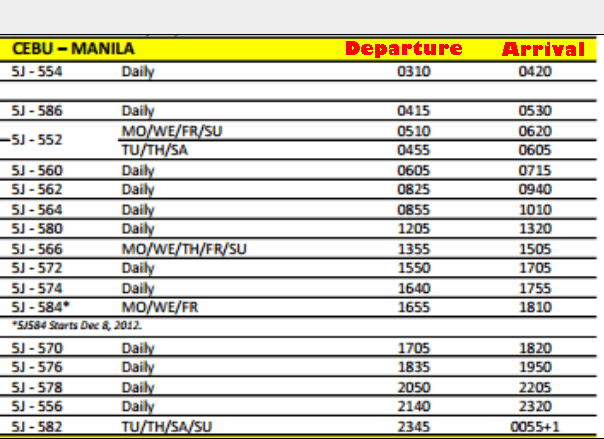 These are the new daily schedule of flights of Cebu Pacific Manila to Cebu and Cebu to Manila. The new schedule was released last December 1, 2012. You can book your tickets at the booking website of Cebu Pacific Air or to any of their Sales Offices and authorized travel agents. You can also call the Reservations Office of Cebu Pacific at these contact numbers: (02) 70-20-888 in Manila and (032) 230-88-88 in Cebu. 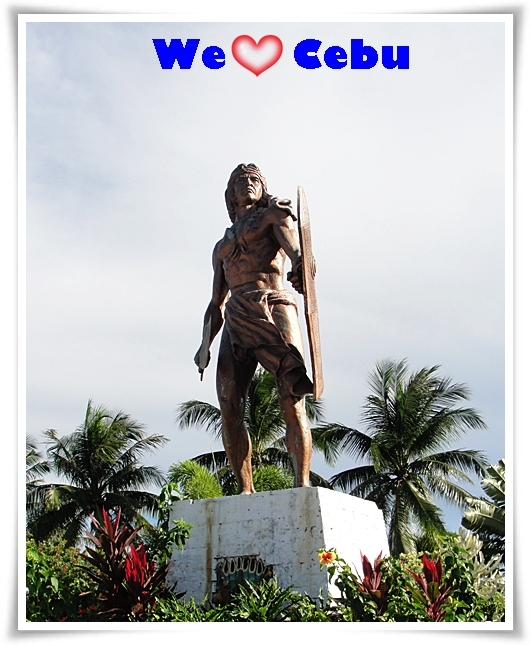 Like the We LOVE Cebu Facebook Page to get more Cebu news, events,promos and travel tips.